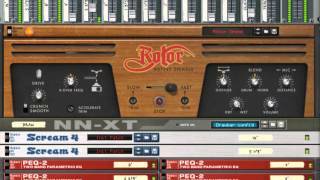 Introducing Rotor, a rotary speaker Rack Extension from Propellerhead. Meticulously modeled on the Leslie 122, Rotor brings the sound of the classic rotary speaker design from the 1940's to the Reason rack. Rotor is perfect for authentic organ sounds, old-school guitar tones or as a unique shaper in your sound design toolbox. Whatever you use it for, Rotor will add a vintage flavor to your Reason rack. The traditional use for a rotary speaker is of course with organs, which is why Rotor comes complete with an included organ instrument for Reason's Combinator, and a set of expertly crafted patches for guitar, drums, vocals and more for a stunning variety of sounds. Rotor carefully emulates all aspects of a rotary speaker, down to the independent rotation and acceleration of the horn and drum, and has settings for mic distance and rotation speed. But Rotor also takes the classic rotary speaker design into the future, with two flavors of built-in preamp distortion, control over the rotation doppler effect, the horn's length and acceleration speed as well as CV output of the rotation, for syncing other Reason devices to Rotor’s speed and acceleration. Includes an organ instrument for Reason's Combinator, and a great set of Rotor and Combinator patches for guitar, vocals, keys and drums. * Tous les noms de produits cités sont des marques déposées de leurs propriétaires respectifs et ne constituent en aucun cas une association ou une affiliation avec Propellerhead Software ou les sociétés interrogées. La mention des produits ou marques déposées sert uniquement à identifier les produits dont les sons ont été étudiés lors du développement et/ou à des fins de comparaison.